The following advice is based on UK recommendations and requirements for towing as far as they could be determined by the author at the time of writing. Neither the National Sonata Association nor the author can accept any responsibility for any accidents or incidents incurred after reading this document. Two Tons and Moving Fast! One of the great things about Sonatas is their speed. On a number of occasions this summer, we saw in excess of 50kts. Similar sustained bursts of speed have seen us sail on the Clyde, Solent, North Sea and Lakes all in the same season. A trailer certainly allows you to get so much more fun from your boat and whatever the disadvantages of a small keel boat, they are, to a degree, mitigated by being able to move swiftly between different sailing venues. However, hauling nearly 2 tons about the country is not a trivial matter and our concerns about towing safely should go beyond just complying with the legal requirements. A boat getting out of control on a windy spinnaker run at 7mph is one thing, but snaking and jack-knifing at 55mph on the motorway is quite another. At the very least, totalling yourself or your boat on the way to a regatta does nothing for your chances of winning. 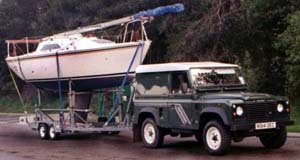 Even when towing with the largest of 4×4’s (Range Rover or Discovery), the boat on the trailer is going to weigh more than the vehicle. Simple physics would suggest that it wouldn’t take much for the trailer to become the tail wagging the dog. Unfortunately, this often dominant partner is running on simple suspension, and with the type of cable brakes that haven’t been seen on cars since the 1930s. This is why some authorities recommend that the trailer should always weigh less (or even only 85%) of the towing vehicle. Although this combination of weights is ideal, it is not a realistic option when towing a Sonata. But the lighter the tow vehicle, the more caution that needs to be used. We all claim to be good drivers, but how many of us have practiced getting the tow back in line when it starts to wander, or how best to perform an emergency stop in the wet? Admittedly problems are rare but not unheard of—several Sonatas have turned over, including one on its way to the Nationals a few years back. What follows is my best effort at unravelling the mysteries of the towing regulations and best practice. I’ve consulted widely on the subject, including the Traffic Police, the RYA, trailer manufacturers etc, but I still can’t claim that this is the definitive word. Much of what I was told was a little vague or even contradictory. We all know that ignorance of the law is no defence in court but it beats me how we are supposed to comply with the regulations when they’re so difficult to understand. Job creation for lawyers? In addition to this not being definitive, it’s also limited in scope to the following. I have assumed the use of a four wheeled braked trailer weighing about 0.5 tonnes (giving a total trailer weight of 1.8 tonnes when carrying the boat) which is being towed by a private vehicle (not a goods vehicle) that weighs less than 3.5 tonnes. the physical strength of your tow hitch and its mounting on the vehicle. There is a legal requirement on you to ensure as far as possible, that your trailer (and accessories) have been built, maintained, and are loaded and towed, in such a way as to ensure that no possible danger is caused to any person (driver, passenger, other road user or anyone else). This goes well beyond just requiring you to comply with the letter of the law. Failure to comply with this ‘duty of care’ can not only result in a fine, but also leaves you wide open to a civil claim made by any injured parties. Neglecting your ‘duty of care’ might include a lack of maintenance on the trailer (including unserviced brakes and wheel bearings or excessively rusting metal work), to the use of tie-down ropes that are too weak or knackered. 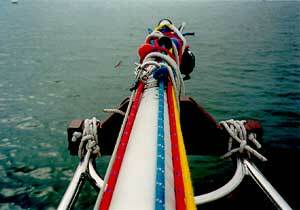 Part of your responsibility in loading the boat, is to get the correct weight on the hitch. There should be about 50 to 100kgs of download on the hitch when it is attached to the vehicle. On a single axle trailer this is achieved by moving the load back and forward. But it is much more complicated on tandem wheeled trailers where the tow bar height is also critical. The trailer must be towed level so the weight is carried evenly on both axles. More seriously, where the tow hitch on the vehicle is too low (often the case when the car is loaded with gear and passengers), the hitch can actually exert an upward lift and thereby so reduce the down force on the rear wheels of the vehicle that they will have only marginal grip to resist jack knifing. This is why vehicles such as the Discovery have a hitch that can be adjusted for height. For those of us who had licences before 1st July 96, there is no change to the regulations. The situation is totally different for new drivers, and they’re best to phone the DVLA on 01792 772151 for help. This is the weight of trailer complete with the boat, and is best found by sitting it on the weigh bridge without the vehicle. is a similar thing but for the loaded tow vehicle, complete with passengers. is the combination of the vehicle and the trailer’s gross weights. is the upper limit imposed by the manufacturer, and shown on the plate on the draw bar of the trailer. The trailer’s maximum capacity is its maximum gross weight less its kerbside weight. is with no driver or passengers but a full tank of fuel. is its weight unloaded (ie, without the boat). There are only two legal requirements for weights and loads: One is that you must not exceed the Gross Train Weight (GTW) that is shown on the manufacturer’s ID plate under the bonnet, and the other is that you mustn’t exceed the trailer’s ‘Maximum Gross Weight’. 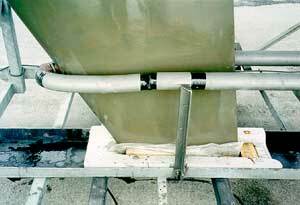 Technically, all the boat aft of the rear hull support on the trailer is an ‘overhang’, and not just the mast that sticks out beyond the transom. 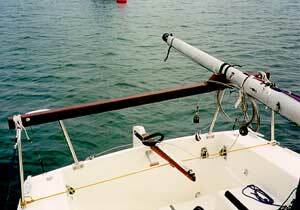 As this ‘overhang’ is usually more than 1 metre on Sonatas, a red flag or streamer should be attached to the end of the mast. If this total overhang is more than 2 metres, an ‘end marker board’ should be substituted for the flag. These regulations vary slightly depending on the age of the trailer and the width of the towing vehicle, but this is what is normally required. The trailer board needs; 2 red rear lamps, 2 stop lamps, number plate and light, 2 red reflectors, 2 amber indicators, 1 rear red fog lamp, 2 white forward facing reflectors. In addition, as most Sonata trailers are more than 2.1 meters wide, we also need white forward facing lamps on the trailer board or mudguards. The lighting board must be wide enough so the outer edge of the rear lights is within 150mm of the outer edge of the boat. This lighting board should be positioned within 1 metre of the end of the total overhang (which is often the mast), or otherwise the end of the overhang would have to be lit with an addition reflector and red lamp. The lighting board should not be more than 1.5 metres off the ground, (or 2.1 metres if the structure of the trailer makes this impracticable – so can we put the board up on the transom?) The trailer also requires at least two amber reflectors down each side. The same regulations as car tyres now apply to trailers, viz tread depth, etc. In addition, you cannot mix radial and crossplys at all on a tandem wheeled trailer. Trailers built since 1983 must have overrun brakes on every wheel, worked from a coupling that is damped and matched with the brake linkage. The brake efficiency must be 45%. In addition, there must always be a working parking brake capable of holding the laden trailer on an 18% gradient. (nearly 1 in 5 ) All trailers must have a break-away cable that will stop the trailer automatically if it becomes uncoupled. Speed limits are 60mph on motorways and dual carriageways, and 50mph on other roads. We cannot use the outside lane on a three (or four) lane motorway. Insurance cover for your boat when trailing is provided by a combination of your vehicle and boat policy. Liability for damage caused by the boat / trailer combination when attached to the towing vehicle (or after it has become accidentally detached), should be covered under the third party liability section of the vehicle policy. 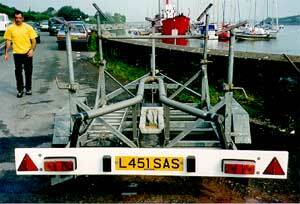 Damage caused to the boat or trailer would have to be claimed under the boat policy. A common way that insurance companies wriggle out of claims is when you have failed to tell them all the ‘full, true and accurate information’ when buying the policy. Its not good enough to just tell them you plan to tow a trailer, you have to mention it weighs nearly two tons. Some insurances are not happy if the weight towed exceeds the manufacturers recommendation, whilst others heed the National Caravan Council’s recommendation that the trailer gross weight (TGW) should not exceed 85% of the kerb weight of the car. If they say it’s okay to tow a Sonata, get it in writing. Check that the tow hitch and mounting on your vehicle is rated high enough for your intended load. Sonatas are far from inconspicuous as they trundle down the motorway. They’re big and even those sitting on the best trailers still look precarious. Landlubbers, who don’t appreciate how the keel keeps the centre of gravity down, only see the bulk of the boat perched high in the air. So, as we don’t go unnoticed, could we survive a second look from the police? (This is usually done as they creep infuriatingly slowly past in the outside lane. In these situations, I always think it would be best to smile and give them a friendly wave, but somehow I only manage a grimace, white knuckles and a look like a rabbit in the headlights). does the towing vehicle look big enough? does the trailer look well maintained? does the boat look properly tied down? The more you (or your vehicle & trailer) deviate from their concept of normal, the greater the chance is that you are going to have to prove your set up is legal. Therefore it helps to carry weighbridge tickets; work on the trailer so it doesn’t look like a moving scrap yard; and tie the boat down with ratchet straps, or decent ropes with wagoner hitches. 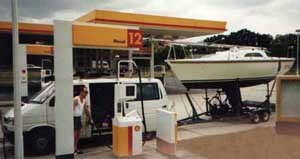 This last point was brought home to me when I was stopped on the way to the Rover Series. Despite my boat being tied down with sound mountaineering knots, this was outside of the policeman’s experience, so he made me re-tie it all with knots he knew, and I missed my cranage slot at Kip. It cannot be assumed that the regulations are consistent across Europe. One Sonata owner used to tow his Sonata behind a Mondeo (1.8 Turbo Diesel) which he believes was legal. He could prove that he had made some efforts to understand what was required of him (he has all sorts of information sheets, and has kept records of conversation with his trailer manufacturer). He carried weigh bridge tickets that show the weight of his car, trailer and boat was 3160kg, and was therefore under the Gross Train Weight (GTW) of 3175kg shown on his vehicle ID plate. His trailer was plated at 1800 kg (Max TGW) and again had weigh bridge tickets to show the weight of boat and trailer was 1780kg. Although the towed weight was in excess of Ford’s recommendation, he had informed his insurance company, whose agreement he had in writing. He believes he complied with the law, was covered by his insurance, and could prove he had exercised his duty of care by the condition of his trailer and equipment, the way he drove, and the records he kept—puts the rest of us in the shade a little?